Large sepia-toned group portrait photograph of the firefighters of K.C. Barker Company No. 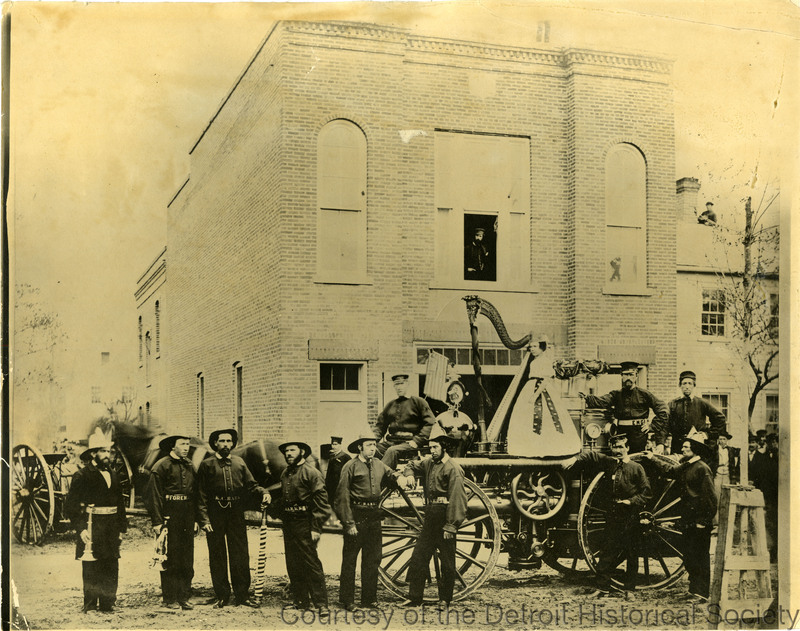 4, posed with their horse-drawn fire engine in front of their fire station, presumably at Orchard Street and Fifth Street during a memorial parade for Abraham Lincoln. A young girl in a dress decorated with a ribbon, a harp, a small portrait of Lincoln, banners, garland, and a small flag are on the engine. The majority of the firefighters wear matching shirts, pants, helmets, and belts printed with "K.C. Barker." The men standing on the engine wear peaked caps, and one standing on the rear also wears a belt identifying him as an engineer. Two of the men on the far left hold bugles. One of them wears a "foreman," belt, the other wears one that is only partially legible, "2nd A[...]." The two men to their right both lean on an upright hose nozzle. The station in the background is a two-story brick structure, and two people peer from its upper windows. A hose apparatus is in the street on the left edge of the frame.